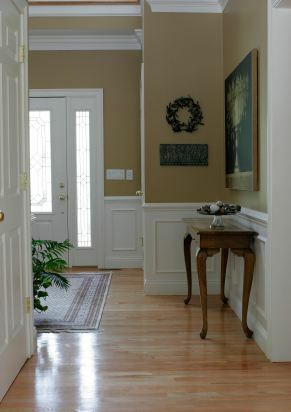 All City Construction and Remodeling can add a touch of elegance to any room with simple wood enhancements, such as Installing new trim or crown moldings. Carpentry professionals here at All City Construction and Remodeling are skilled in installing all types of wood accents to create classy enhancements to any home. Adding chair rails in a formal dining room or wainscoting in a guest bathroom are popular choices. Freshen up your home today with light carpentry, such as wood accents by All City Construction and Remodeling. Make your guest bathroom homey with beautiful wainscoting, crafted and installed by All City Construction and Remodeling. We can also install custom paneling, trim work and moldings to increase your home's warmth and appeal. Upgrading the interior doors in your home is another way to instantly increase your home's value and appeal. All City Construction and Remodeling will expertly measure each door to ensure you're getting a perfect fit. From adding French doors to the family room to increasing storage space with beautifully crafted storage benches or shelves, All City Construction and Remodeling will wow you with attention to detail and expert craftsmanship.